Scene setting: Philipp Plein fished 80 cars out of a Milan junk yard, covered them in gold and silver foil and then had a gold monster truck ram over them, that ended up exploding into a burst of firework flames before a live audience of 1200 people. In between all of this, 12 mohawked motorcycle riders did wheelies, 2 BMWs rode on their left two wheels only, and 2 police cars chased each other in circles like screaming mosquitoes before a rapper came out to holler a hip hop song. Mood board: The mood of the show was just as delinquent and aggressive as the set. 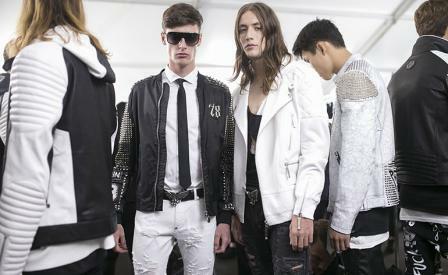 The designer called it Plein Punk, which meant tons of ripped jeans, motorcycle jackets and slacker shirts. Finishing touches: Plein has never met a silver stud he didn't love. He covered every inch of his black leather backpacks, high top booties and leather gloves with a blanket of sharp metal.